A quarterback (QB) is a position in American and Canadian football. Quarterbacks are members of the offense, or attacking team. They line up directly behind the center, in the middle of the offensive team's line. A quarterback is usually the leader, and starts most plays. In addition, the quarterback gives commands to the other players before the start of a play. A quarterback will in most attacking plays throw the ball to a member of their team, ready to run to the end of the pitch. Quarterbacks may also run the ball themselves, as well as hand the ball to a runningback. These players are usually the faces of their respective teams. Some very notable players at this position in history are Tom Brady, Jim Kelly, and Peyton Manning. 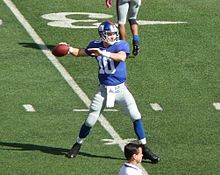 New York Giants QB Eli Manning throwing in pre-game warmups in 2009. Note how he holds the ball and the position of his legs. If quarterbacks don't like the formation the defense is using, they may use an audible. An audible is a way for the quarterback to change the play at the line of scrimmage (where players line up to start a play). He changes what the play will be by shouting out things that his teammates will understand. An audible may be called if the quarterback sees how the defensive players are lined up and does not think that the play that has been called would be good against how the defense is lined up. ↑ "Football Glossary". First Base Sports. ↑ "Audible - Football Terms - Hot Route - Hot Read - Quarterback Audibles". This page was last changed on 11 February 2019, at 20:04.